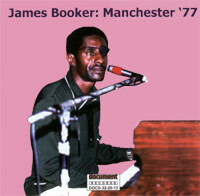 Document Records have one James Booker Cd in its catalogue: Manchester '77. This James Booker CD captures a magical moment in time during his career. Booker's energy, wit, intelligence and remarkable talent are demonstrated here during a vibrant and fascinating performance made during his 1977 European tour. Recorded live at The Lake Hotel, Belle View, Manchester in October 1977.